As part of the planned concerted effort to defeat President Buhari and the APC in 2019, a memorandum of understanding (MoU) was sugned on Monday afternoon in Abuja by some leaders of a faction of All Progressive Congress (APC), and opposition parties for the 2019 general elections. The Reformed APC (R-APC) members were led to the big meeting by their leader, Buba Galadima, who met with leaders of the PDP, SDP and others to sign the deal. 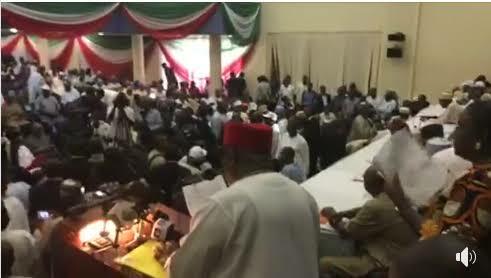 It was gathered that apart from Galadima, others at the Monday meeting from the PDP include Deputy Senate President, Ike Ekweremadu, former Vice President, Atiku Abubakar, Senator Dino Melaye, and Akwa Ibom State Governor, Emmanuel Udom. While briefing journalists, a former senator, Ben Obi, said the parties gathered to sign a memorandum for a coalition that will take over power in 2019.